PARADISE ISLAND, Bahamas (AP) — Experienced Gonzaga and Virginia sent not-so-subtle reminders not to discount talented, veteran-led teams. While Duke and its vaunted freshmen class were the talk college basketball for the first two weeks of the season, Gonzaga and Virginia walked away with titles to cap off Thanksgiving holiday tournaments. The Zags held off the much-ballyhooed Blue Devils to win the Maui Invitational — and replaced them as the No. 1 team in the country on Monday — in what could have been a preview of a late-March showdown. At the other end of the spectrum were the fourth-ranked Cavaliers, who beat Wisconsin to win the Battle 4 Atlantis in a low-scoring game featuring teams content to grind it out with defense and clock-melting stretches that limited the number of possessions and magnified any mistake. “We said we want to learn something as every team would as they come into this tournament,” Virginia coach Tony Bennett said after Friday’s win against the Badgers and preseason Associated Press All-American Ethan Happ. Experience also showed for No. 5 Nevada and No. 9 Michigan State in winning separate brackets at the Las Vegas Invitational , with both being led by upperclassmen (Wolf Pack fifth-year senior Caleb Martin and Spartans junior Cassius Winston) who earned MVP honors. And in Michigan State’s case, that title came by maintaining poise well enough to rally from 19 down against No. 17 Texas. Maui had the best field of the week with Duke, Gonzaga and Auburn, so there were plenty of measuring-stick moments among legitimate Final Four contenders. No team was more impressive than Gonzaga — in any tournament. The Zags offense created problems for then-No. 1 Duke, with the Blue Devils having a hard time deciphering all their ball screens and motion. Gonzaga will only get stronger when 6-foot-10 junior Killian Tillie returns from preseason ankle surgery in the coming weeks. Tournament MVP Rui Hachimura, a versatile and aggressive 6-8 junior forward, is establishing himself as one of the nation’s top players. Gonzaga’s win moved the Zags from third to No. 1, while Duke dropped to No. 3. Auburn, which finished third in Maui, stayed at No. 8. Fourth-ranked Virginia showcased a growing, game-changing presence in 6-7 redshirt sophomore De’Andre Hunter. Hunter was the Atlantis MVP in the Bahamas after three sometimes-dominant performances. First came a near triple-double against Middle Tennessee. Then he matched a career-high with 23 points and hit a key 3-pointer with about a minute left to help hold off Dayton . He closed with 20 points against No. 22 Wisconsin. He was the ACC’s sixth man of the year last year but suffered a broken wrist that sidelined him for the NCAA Tournament — and the Cavs certainly missed him as they struggled to contain UMBC’s guards in that unprecedented 16-vs-1 March upset. As long as he stays healthy, he’s a weapon at both ends alongside veterans Kyle Guy and Ty Jerome, not to mention Virginia’s best NBA prospect by far. 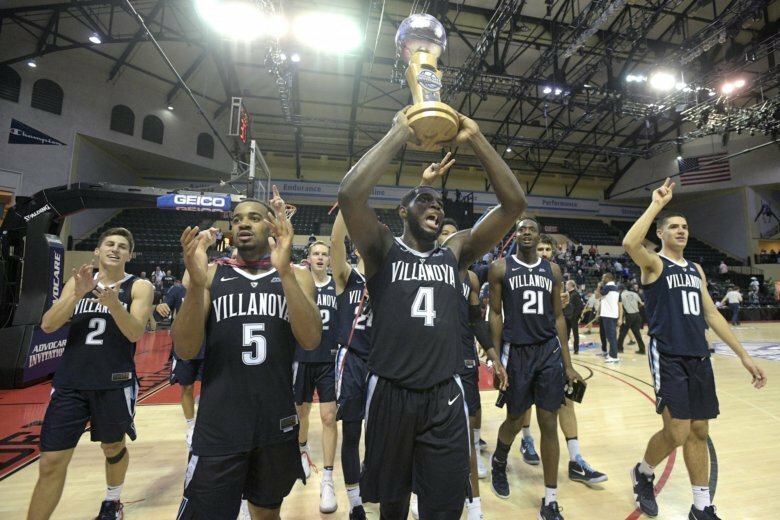 There is reason for optimism at Villanova, though the reigning national champs still have work to do. Villanova, which jumped back into the poll at No. 23 on Monday, looked more like it had figured out that path at the AdvoCare Invitational in Orlando, Florida. And they are still growing, trying to replace the talent from last year’s title winner, including AP national player of the year Jalen Brunson and Final Four most outstanding player Donte DiVincenzo. Freshman Coby White could be taking hold of the starting point guard job for North Carolina. He had 33 points — the most by a UNC freshman since Harrison Barnes had 40 in the 2011 Atlantic Coast Conference Tournament — and seven 3-pointers in the loss to Texas in the Las Vegas Invitational. He followed with 19 points and eight assists against UCLA, though the loss dropped North Carolina to No. 11. The production came with junior point guard Seventh Woods sidelined by a concussion. Woods lacks White’s scoring potential but has 27 assists with just six turnovers. Oklahoma senior guard Christian James appears ready to fill the scoring void created by the one-and-done departure of Trae Young to the NBA. Young led the country in scoring and assists; James arrived at the Battle 4 Atlantis averaging a Big 12-best 22.7 points. AP Basketball Writer John Marshall in Lahaina, Hawaii, contributed to this report.